Easy & Fun Mosaic Art. Align frame over color guide & press modeling material into holes. Peel off guide to reveal your masterpiece! 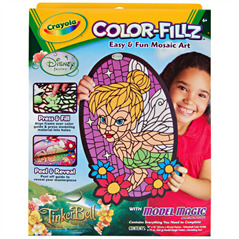 Only one Color-Fillz Disney Fairies is included with Purchase. Picked at random. Crayola is great at coming up with smart and creative ways for kids to explore color. 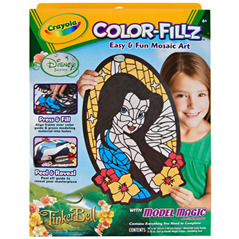 Since our niece is a little Disney Fairy fan - and a slight Picasso if you do say so yourself - this arts and crafts gift is perfect. Plus, it's mess-less which her mom with love.